If you live in the West Florida region and have been searching for someone to mount TV on wall services then you’ve come to the right place! Suncoast Installs has been installing mounted televisions and unmounted televisions in West Florida since 1999 and we’re the company that everyone recommends if you’re in need of any kind of installation service at all! One of the most difficult TV installation options is hiring someone to mount TV on wall services. Why? Because it doesn’t just involve knowledge of televisions, wall mounts and a toolbox on hand. When you hire someone to mount TV on wall services you need to know that they also have knowledge of physics, electrics, and even construction! For example, perhaps you want to hire someone to wall mount your TV in your game room. This is going to require running wiring behind the wall and an extra secure TV mount to ensure that everyone in your game room remains safe. Would you trust this job to someone who didn’t have the proper knowledge to do the job properly? We certainly wouldn’t which is why we only hire thoroughly expert installation technicians and require them to take part in regular training programs! You aren’t always looking for someone to mount TV on wall services. Sometimes you just need someone to help you to get your new big screen TV set up on a tabletop. Our experienced technicians can do this for you too! From making sure that your cables are all properly connected to helping you to decide whether someone to mount TV on wall services might be a better option for the layout of your room. Whatever TV installation option you choose, our technicians can get the job done. Here at Suncoast Installs, we don’t just specialize in someone to mount TV on wall services or tabletop TV installation services! Our trusted technicians are well trained in art installation too. Whether you want your recent Degas purchase hung in a place of prominence with feature lighting to highlight it’s beauty or whether you want to hang that framed picture your toddler drew you in preschool today, our technicians have the tools and the technical know-how to get the job done professionally. From wall mounting paintings to creating custom displays for your sports memorabilia, our installation experts can get the job done and do it so well that you might just think someone had picked up a section of your favorite museum and set it right down in the middle of your home. You may be asking yourself “why Suncoast Installs?” With so many installation companies to choose from locally why should you trust Suncoast Installs with your business? Why should you call us when you’re looking for someone to mount TV on wall services or any other service for that matter? Simply put, because we have a reputation that backs up our work. Having provided installation services in the same area since 1999, you can safely assume that we have installed a large percentage of products in West Florida homes and our review ratings are consistently five-stars. What is it that people love about our services so much? We hire only technical experts to do our installation work. Our prices are always designed with your budget in mind. We are always kind and courteous when invited into your home. Our technicians always clean up after themselves when they perform a job for you. We provide appointment times and keep them! Unlike your local handyman, we know what we’re doing! Ready to Get Started with Someone to Mount TV on Wall Services? If you’re ready to get started with someone to mount TV on wall services or any of the other installation services that we offer, give us a call! 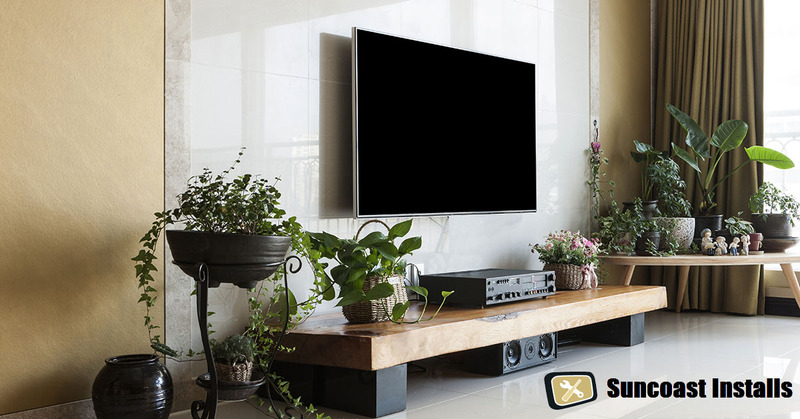 Here at Suncoast Installs, we pride ourselves in our fast response time and we’ll get your TV wall mounted and your remote control programmed in no time at all! So, what are you waiting for? Pick up the phone and dial us at 727-480-8358!